Boca Raton – (December 20, 2010) – Where do you start when trying to find the best pizza in your local area? In the past year, “The Pizza Expert” ate his way through 25 states, tried his favorite recipes that included a Grandma and Upside Down pizza, and reviewed over 500 pizza restaurants, all in the search of finding the best pizza. This year, WorstPizza.com , the ultimate resource for pizza reviews and recipes, highlights their first top 10 list of pizza parlors in the U.S for 2010. 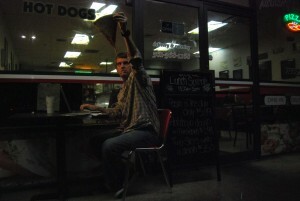 The list is compiled each year by “The Pizza Expert” and his team of professional pizza reviewers on WorstPizza.com . Contrary to the name Worst Pizza, the website critiques, entertains and gives thoughtful reviews of pizza and the restaurants that sell it. This year’s list ranges from little-known pizzeria’s in Mount Vernon, NY, to the kings of pizza in New Haven, CT, to cities that are world-renowned for their pizza’s like Brooklyn and Long Island, NY. Through his website, the top 10 list changes and gets updated each year based upon the preparation and ingredients used by the pizza makers. “You can tell when restaurants use high-quality products like Grande Cheese with a little Pecorino, Caputo Flour and San Marzano Tomato Sauce,” said Craig, founder of WorstPizza.com. “It's about quality in, quality out,” Craig further states. Established in 2006, WorstPizza.com is dedicated to finding the best pizza places by sifting through the worst. Unlike other pizza review sites that only look for good, we also expose those with poor quality. Worstpizza.com has appeared as an expert on pizza with CBS, FOX, NBC, Wine Library TV, as well as in Slice, Thrillist, Sun-Sentinel and Palm Beach Post. Worstpizza.com is owned and operated by The Pizza Experts LLC, who also brought the first www.pizzatweetup.com to the masses. The Pizza Expert is known as “Lapp” and his goal is to travel the world in search of the best pizza. He shares what he finds when he's had a slice on WorstPizza.com . Growing up in the New York Metro area, he learned what some of the best and worst pizza are like. Going beyond the “college dorm box pizza,” he looks for real, restaurant pizza with high standards of quality. Thanks to Devin Desjarlais for the photo!